Boasting of the world’s fastest-focusing AF focusing speed of 0.03sec. *^ during Live View shooting, an attractive variety of functions and high operability, this EOS DSLR will take your photos to the next level. 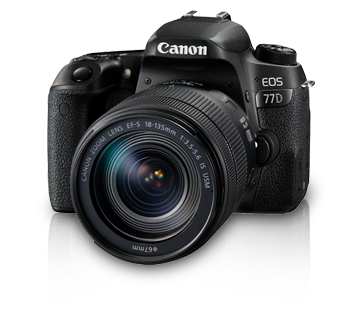 It comes with two electronic dials to enable the same hands-on, analog operational feel that you get on high-end cameras. Camera settings can be done almost instantly. Normal ISO speed as high as ISO 25600 is realized thanks to DIGIC 7, which contributes to beautiful photos and movie footage with minimal noise and camera shake. Fast and precise autofocus is also possible regardless of shooting style. Of worthy note is the Live View AF, which is able to establish focus in as fast as 0.03 seconds^due to an improved Dual Pixel CMOS AF system. For viewfinder shooting, the up to 45 All-cross-type AF point system densely covers a wide area of the viewfinder screen for better precision. Movie shooting is also more exciting than ever, with various shooting options such as Time Lapse and HDR movies, in addition, to support for Full HD 50p / 60p.